Golden Wedding Party for Harry and Marian Chandler 5 Jun 1944. 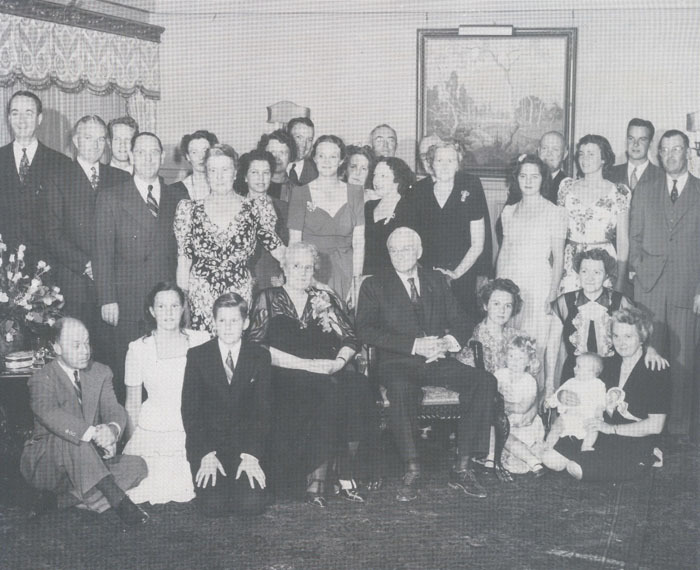 Standing (C. for Chandler): Jack Garland, Norman C., Ralph Staver, Herbert Howard, Eleanor (Booth) Howard; Mabel (Otis) Booth, Marian (McPherron Hammond, Buff C., Phil C., Helen (C.) Garland; Winifred (Farnsworth) Booth, Ralph C., Lenore C., Franklin Otis Booth, Ruth (C.) Williamson, Theodora Hammond, Theodore Hammond, Camilla C., Bill Goodan, Franklin Otis Booth Jr. Seated: Earle Crowe, Sue Williamson; Tad Williamson, Marian (Otis) C., Harry C., Ruth (Goodan) Staver, Sue Staver, Jean Staver, Constance (C.) Crowe, May (C.) Goodan.